WILLOW TREE SISTER AND BROTHER FIGURE BY SUSAN LORDI. Willow Tree Figures ‘TOGETHER’ and SISTERS BY HEART. Willow Tree Figures ‘TOGETHER’ and SISTERS BY HEART.. Condition is used but in fabulous condition. Willow Tree Together Ornament. Lovely Anniversary/Wedding/Engagement/Couple Gift. Condition is Used. In box. Duplicated gift. Willow Tree Ornaments . Condition is Used. Dispatched with Royal Mail 2nd Class. 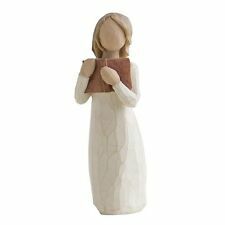 Beautiful Willow Tree Figurine MOTHER & DAUGHTER. with box. Condition is Used. selling due to downsizing! from smoke & pet free home, selling similar items will combine postage where possible Dispatched with Royal Mail 2nd Class. I AM LISTING THIS AS USED BUT IT HAS ONLY BEEN OUT OF THE BOX SO THAT I COULD TAKE THE PICTURE, IT IS IN NEW CONDITION. 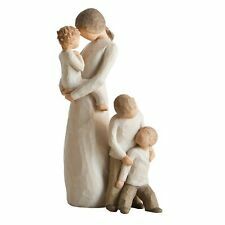 Willow Tree Relationship Family Figures Ornaments - Mother & Daughter. Condition is Used. Dispatched with Royal Mail 2nd Class. Really lovely ornament but no longer suited here. Grab a bargain! :) See my other items and feel free to ask any questions. Good luck & Happy Bidding! UK POSTAGE ONLY. Willow Tree Figure - Mother & Son. Collectable Gift Figurine Boxed. Condition is In great condition- no marks or chips. Dispatched with Royal Mail 2nd Class. WILLOW TREE 5" FIGURES “Surrounded By Love" And “Beautiful wishes”. Condition is Used. Dispatched with Royal Mail 2nd Class. Willow Tree Mother & Daughter Figure In Excellent Condition. Willow Tree Mother & Daughter Figure In Excellent Condition.. Condition is Used. Dispatched with Royal Mail 2nd Class. 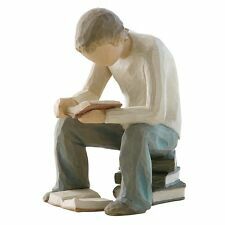 Willow tree figurine, “friendship is the sweetest gift. Condition is used. No box Dispatched with Royal Mail 2nd Class. These influences are revealed in her Willow Tree® sculptures, from which emotion is communicated through gestures only. Williw Tree Mother & Daughter. Good condition no box Dispatched with Royal Mail 2nd Class. Beautiful Willow Tree Figurine MOTHER & SON with box. Condition is Used. Couple of marks have popped pictures of this on listing. selling due to downsizing! from smoke & pet free home, selling similar items will combine postage where possible Dispatched with Royal Mail 2nd Class. 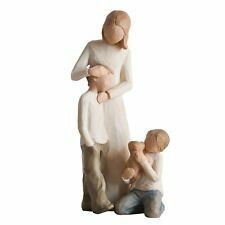 Willow Tree figurine Quietly (mum and Kids). Condition is Used. Dispatched with Royal Mail 2nd Class. Willow Tree My Sister My Friend figurine - great condition . Condition is Used. Dispatched with Royal Mail 2nd Class. Love My Cat (Light) - 27789. Willow Tree. And totally accept us, in whatever emotional or physical state we appear. It is the sense of love, unconditionally.". - Susan Lordi. • Made of Resin. 5cm at tallest point and approx 9.5 cm in length. 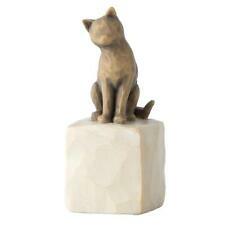 It is cast in resin from Susan Lordi's hand carved sculpture and then it is hand painted with a distressed finish. 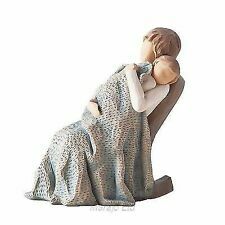 Willow Tree - 'Together' Collectable Gift Figurine. Condition is Used but see pics. Dispatched with Royal Mail 2nd Class. This is an unwanted gift and comes with box, see pics. Absolutely lovely item but just not needed here. Please see my other items. Feel free to ask any questions and Happy Bidding! :) UK POSTAGE ONLY! Condition is Used, but great condition. 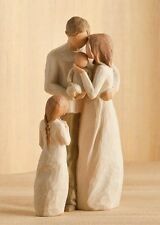 Willow Tree Relationship Family Children Collection Figurine Figures Ornaments. Condition is Used. Dispatched with Royal Mail 2nd Class. Artist Susan Lordi hand carves the original of each Willow Tree sculpture. "I try to keep the interpretation of Willow Tree open. - Susan Lordi. Made From Resin. Not a toy or children's product. Intended for adults only. Supplier reference: 27703. Sculptor Susan Lordi was inspired to make this piece from one of her favourite photos of her toddler daughter holding her newborn brother in this exact pose. This 2018 piece represents a young child holding their new baby sibling. Willow Tree QUIETLY Figure. In good condition, from a pet and smoke free home. UK bids only. More figures in my other listings. Willow Tree figures - Together. Condition is Used. Dispatched with Royal Mail 2nd Class.